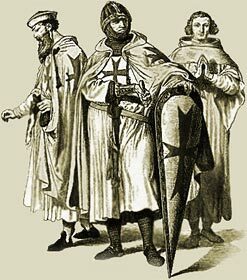 The leaders of First Crusade included some of the most distinguished representatives of European knighthood. Count Raymond of Toulouse headed a band of volunteers from Provence in southern France. Godfrey of Bouillon and his brother Baldwin commanded a force of French and Germans from the Rhinelands. Normandy sent Robert, William the Conqueror's eldest son. The Normans from Italy and Sicily were led by Bohemond, a son of Robert Guiscard, and his nephew Tancred. The months which followed the Council of Clermont were marked by an epidemic of religious excitement in western Europe. Popular preachers everywhere took up the cry "God wills it!" and urged their hearers to start for Jerusalem. A monk named Peter the Hermit aroused large parts of France with his passionate eloquence, as he rode from town to town, carrying a huge cross before him and preaching to vast crowds. Without waiting for the main body of nobles, which was to assemble at Constantinople in the summer of 1096 a horde of poor men, women, and children set out, unorganized and almost unarmed, on the road to the Holy Land. This was called the Peoples Crusade, it is also referred to as the Peasants Crusade. Dividing command of the mixed multitudes with a poor knight, called Walter the Penniless, and followed by a throng of about 80,000 persons, among whom were many women and children, Peter the Hermit set out for Constantinople leading the Peoples Crusade via an overland route through Germany and Hungary. Thousands of the Peoples Crusade fell in battle with the natives of the countries through which they marched, and thousands more perished miserably of hunger and exposure. The Peoples Crusade was badly organised - most of the people were unarmed and lacked the command and discipline of the military crusaders. The Byzantium emperor Alexius I sent his ragged allies as quickly as possible to Asia Minor, where most of them were slaughtered by the Turks. The daughter of Alexius, called Anna Comnena wrote a book about her father and the crusaders called the Alexiad which provides historical details about First Crusaders. Those crusaders who crossed the Bosphorus were surprised by the Turks, and almost all of the Peoples Crusade were slaughtered. Peter the Hermit did survive and eventually led the Crusaders in a procession around the walls of Jerusalem just before the city was taken. The Medieval Times website provides interesting facts, history and information about these great people and important historical events which scatter the Medieval History books including First Crusade . The Medieval Times Sitemap provides full details of all of the information and facts about the fascinating subject of the lives of the people who lived during the historical period of the Middle Ages. The content of this article on Medieval life and times provides free educational details, facts and information for reference and research for schools, colleges and homework for history courses and history coursework.